‘The Paradox of Story: Simplicity and complexity in strategy’ is one of my favorite research articles writen by Dave Snowden. 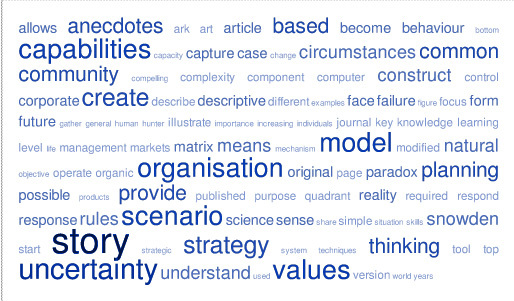 This morning I decided to make a tag cloud of the article with TagCrowd to get a quick overview of the words that play a part in explaining the essence and working of Corporate Storytelling. See here the result. An inspiring piece of art from Snowden to help you in your thinking process when starting to write your own corporate story. A story that helps you to communicate effectively in situations of complexity – often uncertainty -, such as responding to crisises and engaging your audiences in moving forwards more quickly with your commitment to CSR. Something to work from in strategy building or team building workshops.